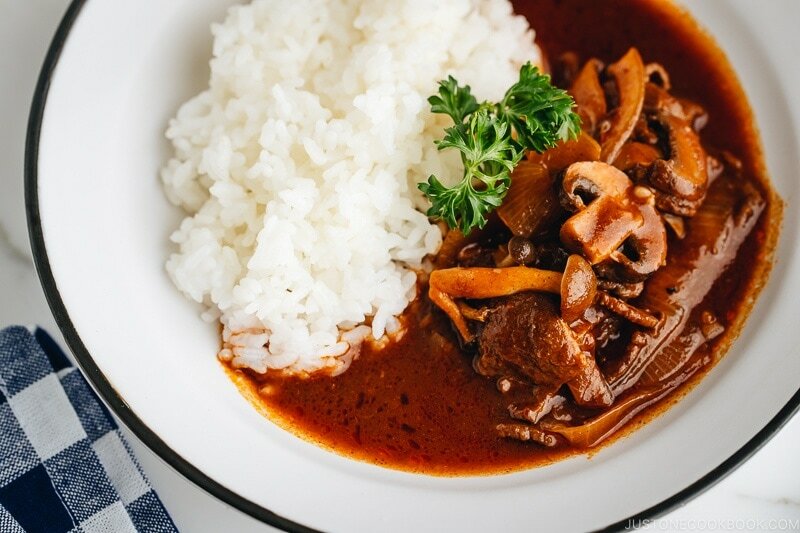 Hayashi Rice, or sometimes called Hashed Beef, is a popular Western-style stew made with tender beef, onions, mushrooms in a demi-glace sauce. 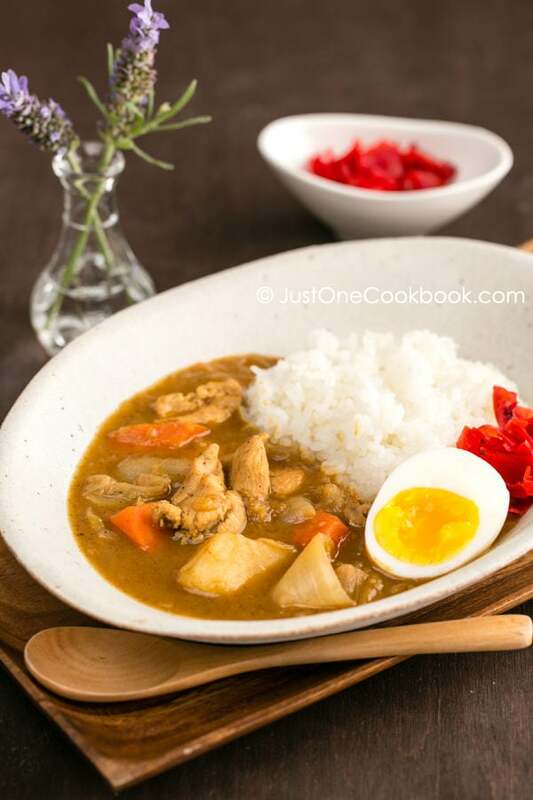 This hearty and delicious stew is served with steamed rice and only exists in Japan despite it’s a Western-style dish. One of my son’s favorite Japanese food is Hayashi Rice (ハヤシライス). He has such passion for the stew that he can talk about how much he loves the tender beef and the delicious demi-glace sauce in great animation. It can be entertaining to watch a kid talk about food sometimes. There is so much excitement, and it warms my heart knowing that all the hours spent in the kitchen is greatly appreciated. I digress a little, but let’s get back to Hayashi Rice, a family staple and a comfort dish for all ages in Japan. 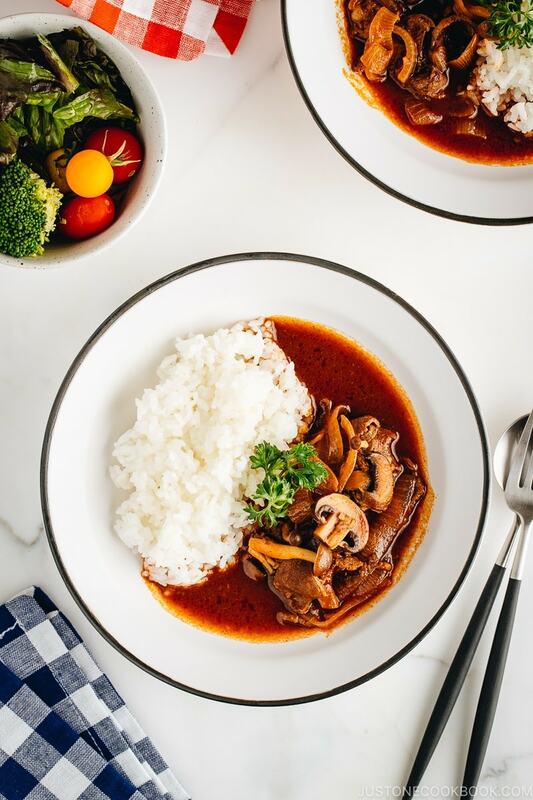 Hayashi Rice, or sometimes called Hashed Beef, is a popular Western-style stew made with tender beef, onions, mushrooms in a demi-glace sauce. 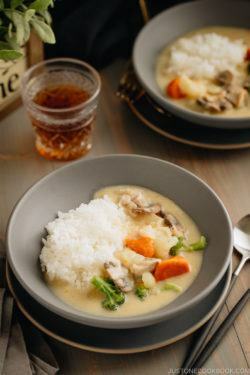 This hearty and delicious stew is served with steamed rice. 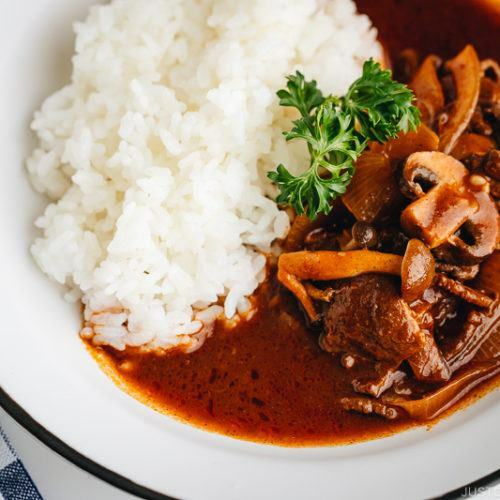 Hayashi rice (ハヤシライス), or sometimes called Hashed Beef (ハッシュドビーフ), is a popular and common Western-style dish in Japan but ironically “unknown” in western countries. 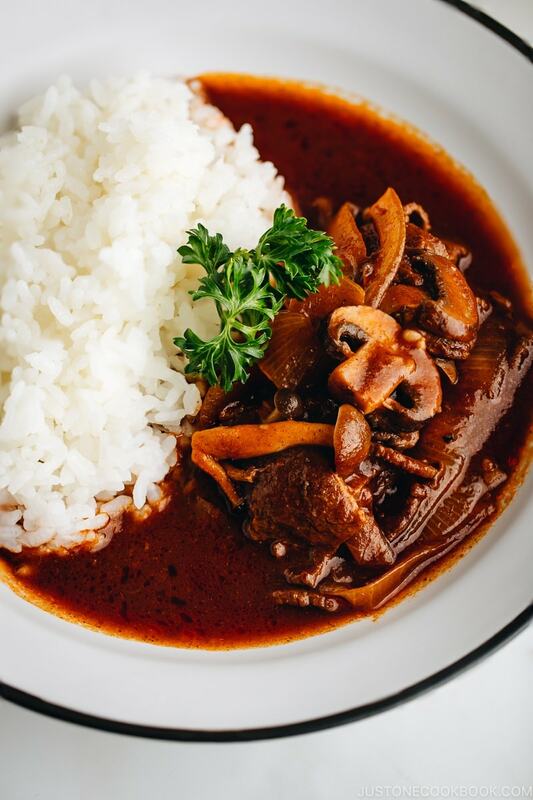 Hayashi Rice usually consists of thinly sliced beef, onions, and button mushrooms cooked in a demi-glace sauce. 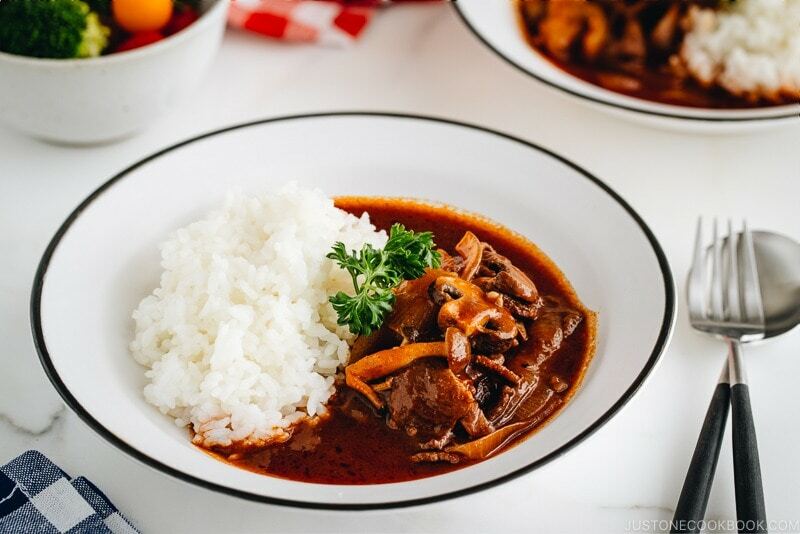 This beef stew-like Hayashi Rice is served alongside steamed rice, like how Japanese Curry and Cream Stew are served. The name was given by Yuteki Hayashi, the first president of the publishing company Maruzen (丸善). 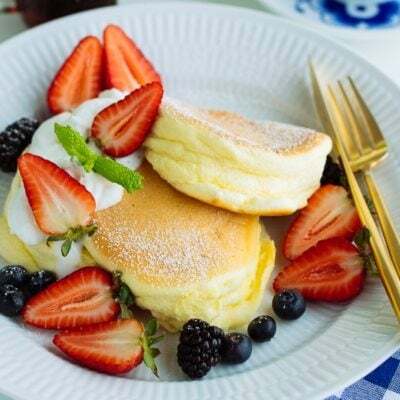 The name was produced by a cook named Hayashi who often served this dish as staff meals at the Ueno Seiyōken (上野精養軒), a popular yoshoku restaurant in Tokyo Ueno. We tried the hayashi rice there this past summer. The name “Hayashi” is simply derived from the British dish “hashed beef”, and it is served over steamed rice so people started to call it Hayashi Rice. 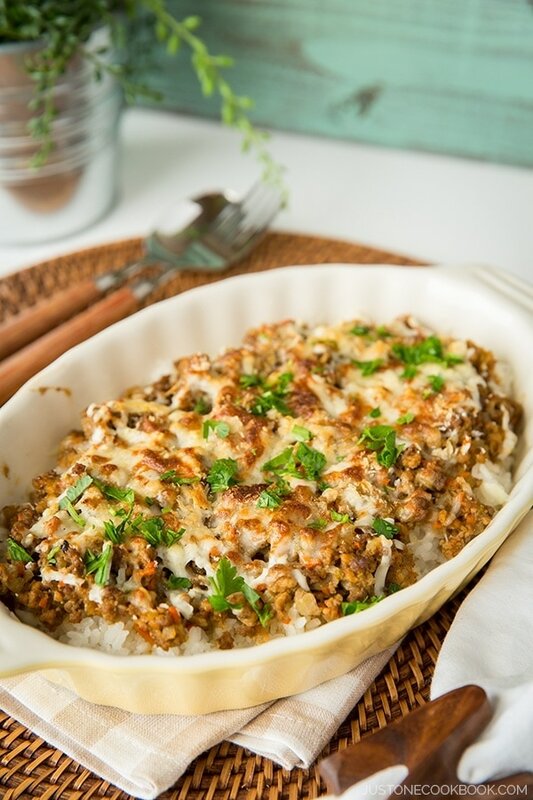 The last one seems to be the most popular theory, as this dish is still called Hashed Beef sometimes. 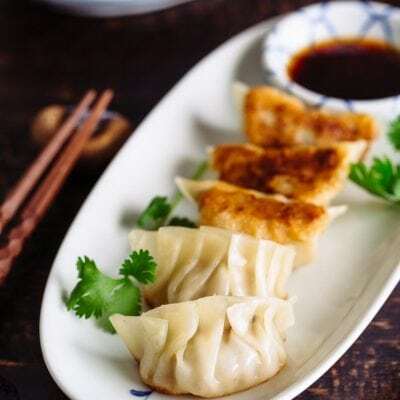 Demi-glace sauce is French for “half glaze”, which is by definition a mixture of half brown stock and half Espagnole sauce that reduced by half. Espagnole sauce (or sometimes called brown sauce) is a classic brown sauce made from the stock of which mirepoix (onions, celery, and carrots), a bouquet garni, and tomato puree are added and then thickened with roux. 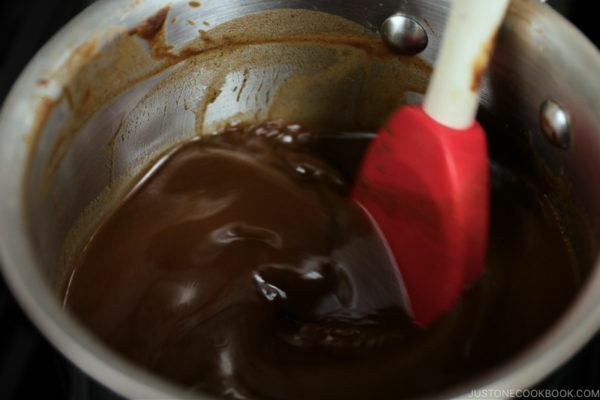 After making the Espagnole sauce, you will use it to produce a demi-glace. Demi-glace was introduced to Japan with the arrival of French cuisine during the Meiji era (1868-1912). 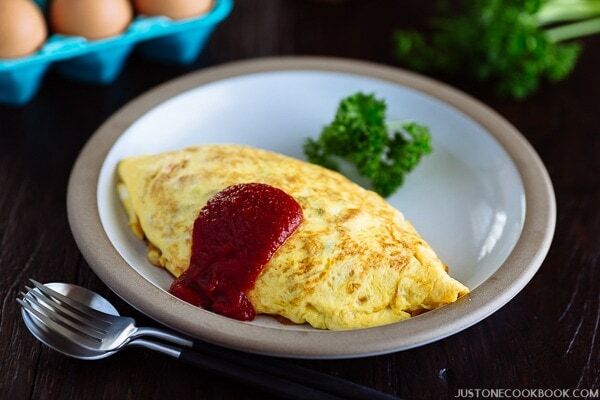 The sauce is used to make Hayashi Rice and other western-style dishes. I have a separate blog post/recipe for my homemade shortcut demi-glace sauce. Don’t worry, the step is not difficult at all, but it does require some time to make (mostly inactive time). 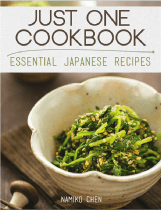 I use sake regularly in my cooking, but I don’t use much of red wine for cooking. Although Mr. JOC would be more than happy to open a really good wine to accompany this meal, we won’t be able to finish a bottle in one night as I’m not much of a drinker. If you or your guests are not a wine drinker, I have a really good tip to share with you. 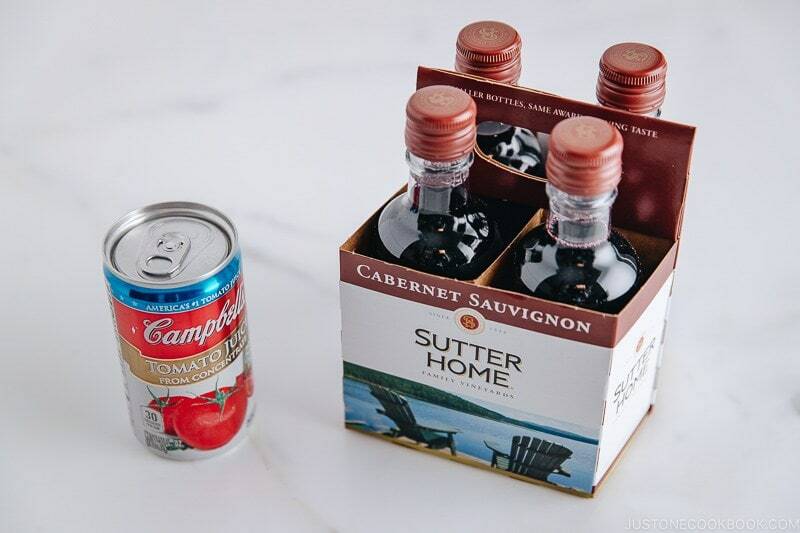 Get a 4-pack Sutter Home® Cabernet Sauvignon – as each bottle only contains 6.3 oz/187 ml, they are perfect for cooking! 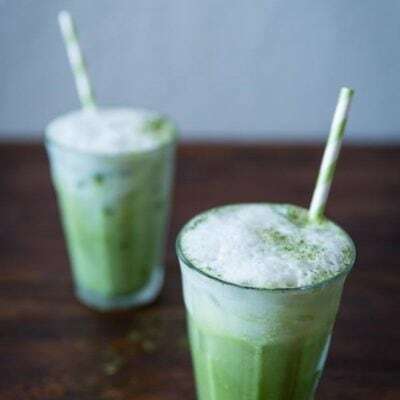 Same goes to tomato juice. I am not a fan of tomato juice (although I love tomatoes); therefore, a small 5.5 oz/163 ml mini can of Campbell’s Tomato Juice is great for this recipe. 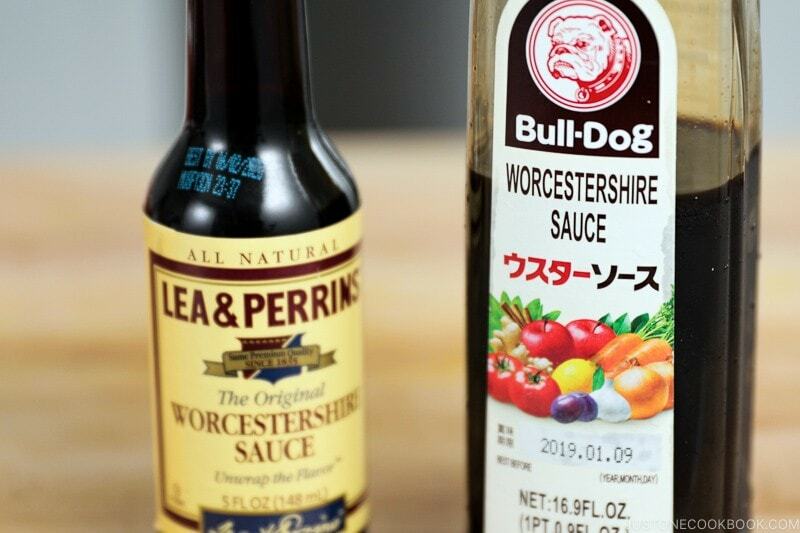 I keep both Japanese Bulldog Worcestershire sauce and Lea & Perrins Worcestershire sauce in my refrigerator and use each sauce for different recipes. Bulldog sauce is slightly sweeter and Lea & Perrins sauce has a tangy taste. For this recipe, I decided to use Bulldog sauce. If you use Lea & Perrins, increase the sugar to 1 tablespoon (instead of 2 teaspoons). In a Japanese grocery store, most of the meat is all cut into paper-thin and nicely packaged. For those of you who can’t find pre-cut thinly sliced meat, you can easily do this at your own home. 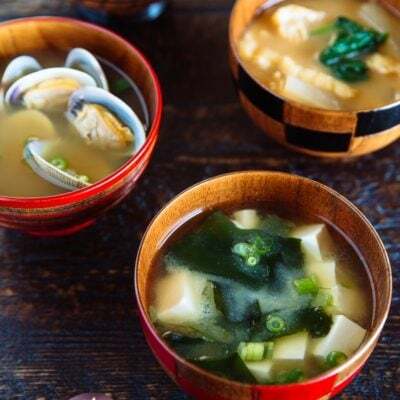 Follow this tutorial to cut the meat thinly, and once you master this skill, you can make Sukiyaki, Shabu Shabu, and many Japanese dishes that require thinly sliced meat. I’ve been making Hayashi Rice for several decades but I have to admit that I never made everything from scratch (excluding beef broth) until this year. When I was in college, Hayashi Rice was on my meal rotations. 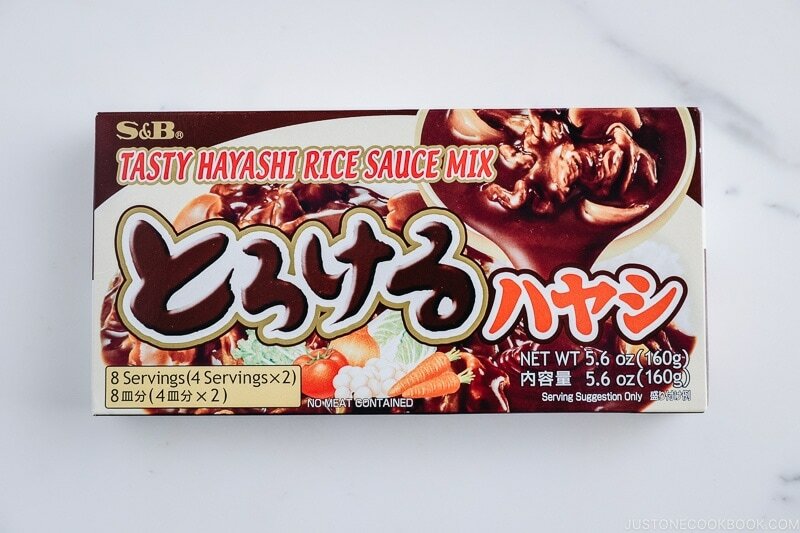 With the convenient “instant roux” (a box containing blocks of roux), Hayashi Rice was so easy and quick to make, just like Japanese curry. In fact, ingredients for Hayashi Rice is simpler, so I probably made more Hayashi Rice than Japanese curry back in the days. For the past 10 years, I’ve attempted to make Hayashi Rice for the kids without those MSG-packed instant roux packages. However, several versions of my so-called “shortcut” Hayashi Rice didn’t get approval from my family. I tried to make demi-glace sauce by mixing various condiments to resemble the taste, which didn’t turn out quite right. I’ve also made a partially-homemade version using premade Demi-Glace Sauce in a can, which turned out okay. Heinz offers this canned demi-glace sauce only for the Japanese market. 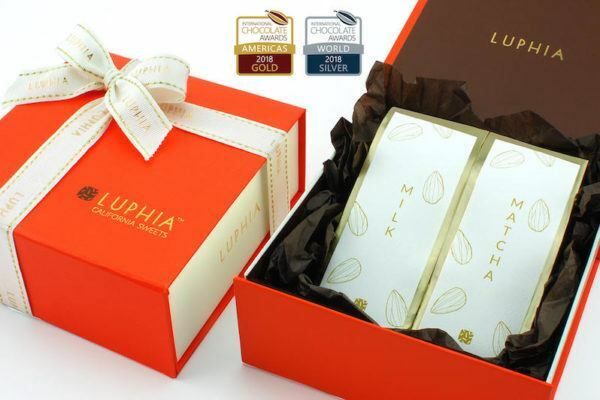 You can buy one from a well-stocked Japanese grocery store here in the U.S. or Amazon (but at a ridiculous price). 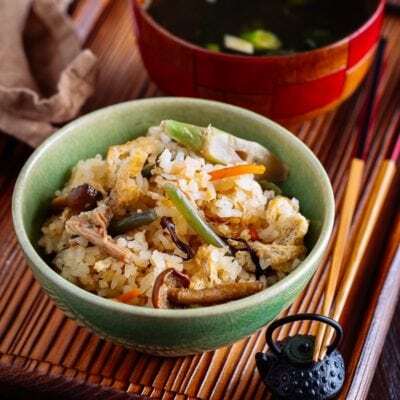 With a growing number of readers’ requests for this recipe, I knew it was the time for me to attempt Hayashi Rice from scratch, without using the instant roux and premade demi-glace sauce. I’ll be honest up front. 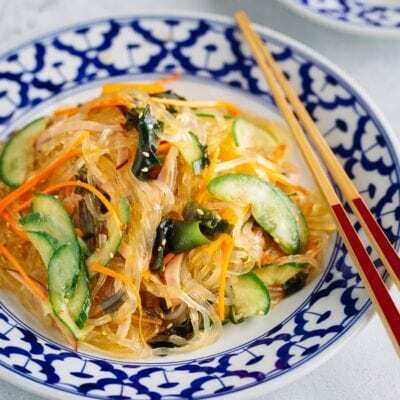 This recipe takes time, and it’s definitely one of those dishes that you would cook on weekends or holidays. But I know for sure that those who try will come back to make it again and again because it is so darn good. 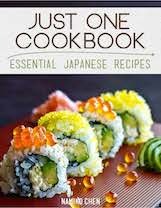 My son even proclaimed the recipe was just as good as some of the yoshoku restaurants he has tried. 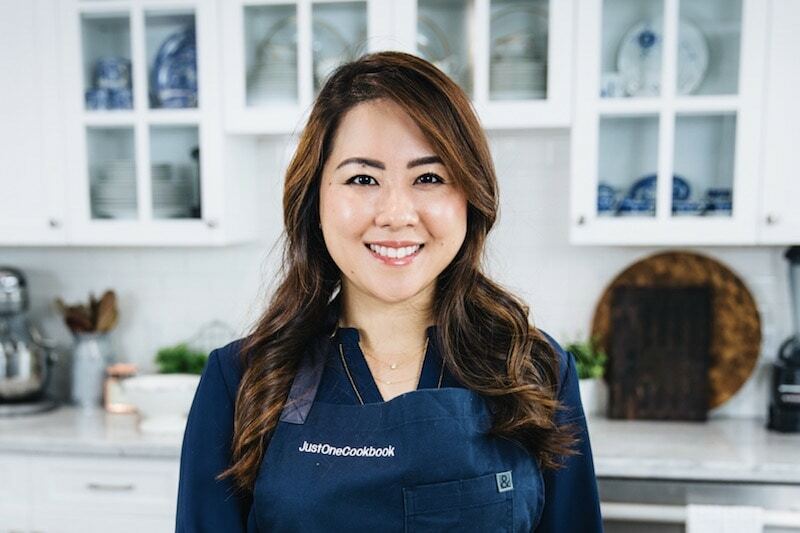 Making Hayashi Rice from scratch gave me a great sense of accomplishment, and I hope you feel the same when you make this delicious meal for your loved ones too! 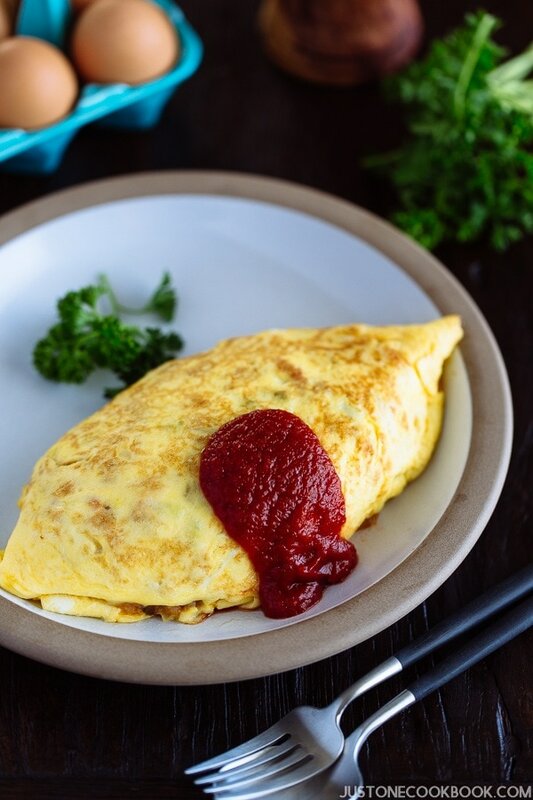 If you have any leftovers, the sauce is great for serving over Omurice (omelet and rice) or Japanese style hamburger steak (Hambagu). 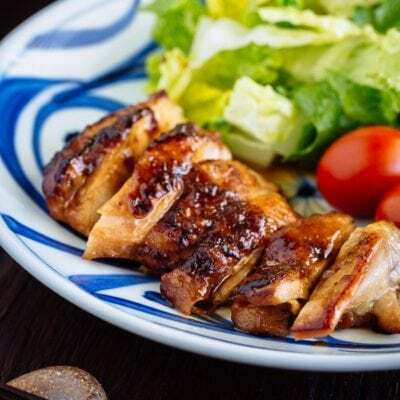 These dishes are common on the menu at Yoshoku-ya (western style diners). 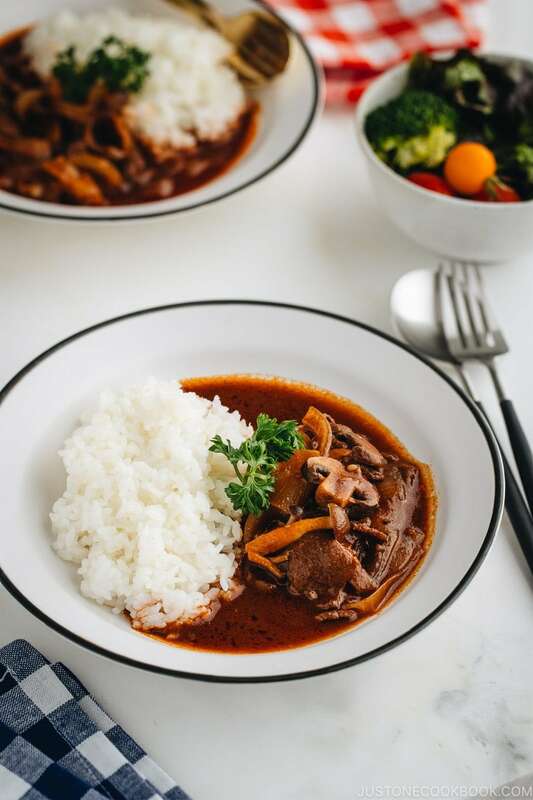 Hayashi Rice, or sometimes called Hashed Beef, is a popular Western-style stew made with tender beef, onions, mushrooms in a demi-glace sauce. 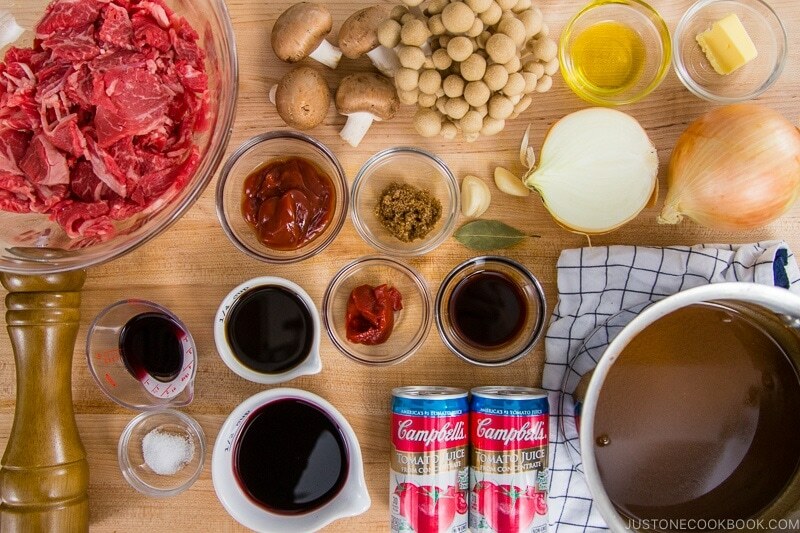 Place the beef in a bowl and season with 2 Tbsp wine, ¼ tsp kosher salt, and freshly ground black pepper. Set aside. Cut the onions in half lengthwise, and cut each half into thin strips widthwise. Cut the end of shimeji mushrooms and separate them. Cut the button mushrooms into thin slices. Heat 1 Tbsp olive oil in the Dutch Oven over medium heat and put the beef. Saute until no longer pink and transfer the beef to the bowl. Melt 1 Tbsp butter in the same pot. Add the onion and a pinch of salt. Saute until coated well with oil. Crush garlic (or add minced garlic) and saute until tender. Add 1 Tbsp tomato paste and ½ cup wine. Add 4 Tbsp Worcestershire sauce and 1 Tbsp soy sauce. Add 3 Tbsp ketchup and 2 tsp brown sugar. Add 1 ¼ cup (326 ml) tomato juice and the demi-glace sauce. Add 1 bay leaf and put the beef back in the pot. Skim the foam and scum using a fine mesh skimmer. Cover, lower the heat, and simmer for 15 minutes. Open the lid and taste the Hayashi Rice. If necessary, season with salt. Serve the steamed rice on one side of the plate and serve the Hayashi Rice on the other side. Enjoy! You can keep the leftover in the refrigerator for 3 days or freeze for up to a month. 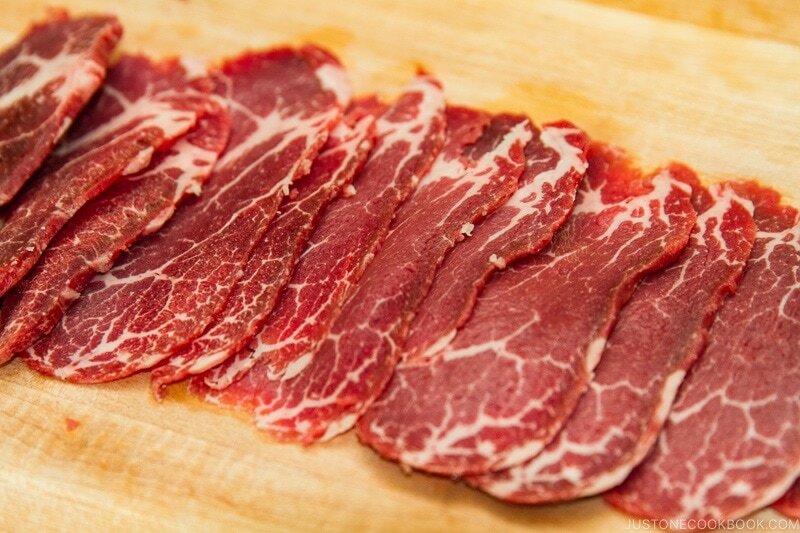 Thinly Sliced Beef: Click here to learn how to thinly slice your meat. I can’t seem to find a way to print the demi-glace recipe. Any help, Nami? Hi Susan! I apologize for my late response. Could you try again from clicking “Print” button inside the recipe card? It will pop up a new window for printing. About how much demi glacé would you say is needed? Hi Anna! Sorry, I did not measure the amount as I made in demi glace recipe (https://www.justonecookbook.com/demi-glace/) and used all of it. hi i am a working mum so i don’t have much time to make the demi glacé sauce. If i use the canned version of demi glacé sauce, how much should i use for this recipe? Hi Evelyn! Each can have specific instruction/recipe in the back usually as I assume every brand made it differently? But if not, add the canned demi glace sauce at Step 6 and do NOT add all the other ingredients. Now after demi glace sauce is in it, add beef stock. I would adjust the taste with ingredients you skipped. If you want more tomato flavor, add that in. 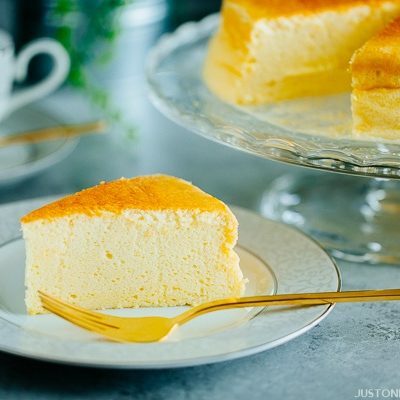 If you need more sweetness, add sugar in, etc. Hope that helps!